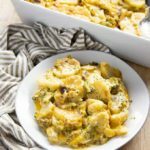 Broccoli Cheddar Scalloped Potatoes are easy to make at home from scratch! 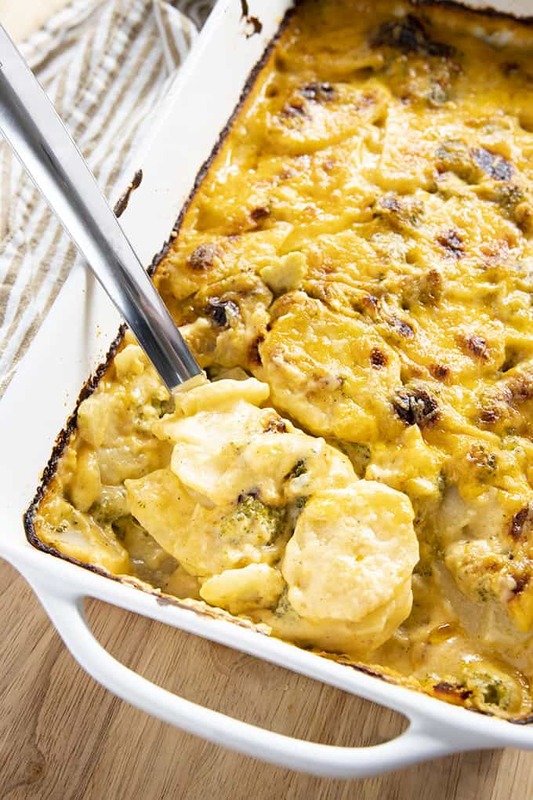 These irresistible scalloped potatoes are drenched in a rich broccoli cheese sauce! I have been so excited to share my scalloped potato recipe with you guys! This sauce with the cheddar, parmesan, and broccoli is over the moon good! Think of this as a super thick version of your favorite broccoli cheese soup slathered on top of potatoes. I used to be afraid of making scalloped potatoes and stuck to Mashed Potatoes only, but it’s so easy! I am going to walk you through the steps and you’ll find that these come together really easily. How do you Make Homemade Scalloped Potatoes? The first thing that you will want to do is make your cheese sauce. You will melt your butter in a large skillet over medium heat and add the garlic, cooking for one minute while stirring constantly. Next, sprinkle your flour right over the garlic and whisk for 2 minutes to cook the flour. Then, slowly whisk your milk right in. I do this in three or four pours. 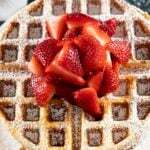 Whisk the entire time until you have a smooth mixture. Allow this mixture to come to a simmer, which will only take 1-2 minutes. Remove your pan from the heat and stir in your seasonings, both kinds of cheese, and broccoli. Cover your pan with a lid and set aside. 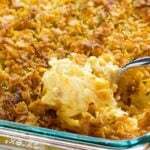 How Thin Should Scalloped Potatoes Be? The next step after making your sauce will be washing, peeling, and slicing your potatoes. 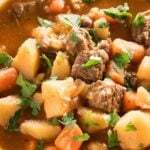 For best results, you will want your potatoes to be very thin, about 1/8 inch thick, or not much thicker than that. They should be as uniform as you can get them so that they all cook through at the same time. To slice your potatoes thin, you can use a Mandoline if you are comfortable with one. 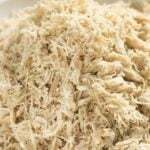 Or, you can use a very sharp chef’s knife or food processor. I find that I usually have the easiest time using my chef’s knife. Once your potatoes are sliced, layer half of them in a large, buttered, baking dish. 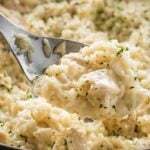 Spoon over half of your broccoli cheese sauce. Repeat with the last of the potatoes, and spoon over the remaining sauce. Cover the dish with foil and bake for 25 minutes. Then, remove the foil, top with extra cheese if desired, and bake for an additional 25 minutes until the potatoes are fork tender. Preheat oven to 400 degrees. 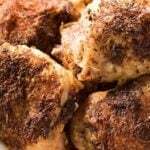 Grease a 9x13 inch baking dish with butter or non-stick cooking spray and set aside. Melt the butter in a large skillet over medium-high heat. Add the garlic and cook for one minute, stirring constantly. Whisk the flour into the butter and garlic mixture, whisking constantly for 2 minutes. 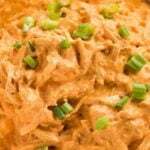 Gradually whisk in the milk until combined and season with salt, pepper, and paprika. Bring the mixture to a simmer then remove from the heat and stir in the cheddar, parmesan, and chopped broccoli. Wash the potatoes and peel off all of the skin. Use a mandoline, sharp chef's knife, or food processor to slice the potatoes into 1/8 inch slices. Layer half of the potatoes in the prepared baking dish and pour over half of the broccoli cheddar sauce. Top the sauce with the remaining potatoes, and remaining sauce. Cover the dish tightly with aluminum foil and bake for 30 minutes. Remove the foil from the pan, sprinkle on the remaining cheese, return the potatoes to the oven and cook for an additional 25-30 minutes until potatoes are cooked through and the top is golden brown. 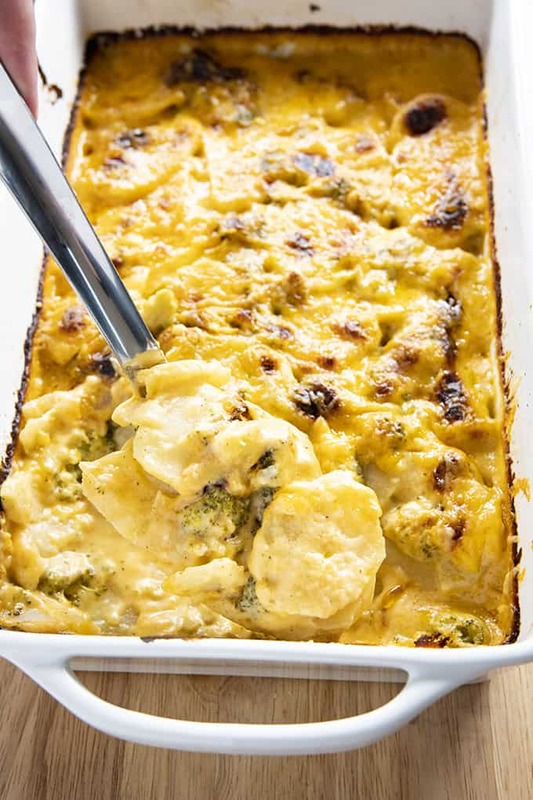 NOTE: The broccoli in this recipe is OPTIONAL if you would like to leave it out for regular scalloped potatoes. Make as directed, just omit the broccoli. NOTE: You can add 2 Cups of diced or cubed ham to make this into a full meal! My family loved it the first time with broccoli and the second time I diced and browned 1 lb of bacon. Added it as 1 layer between the 2 layers of potatoes. I don’t need to say that it disappeared even faster. I also used jarlsberg instead of cheddar since I had a brick of it that was reaching the maturity date. This is definitely a new item in our rotation. Thanks, I’m happy you and your wife enjoyed these potatoes 🙂 We love the crispy top as well! Hi Nichole! 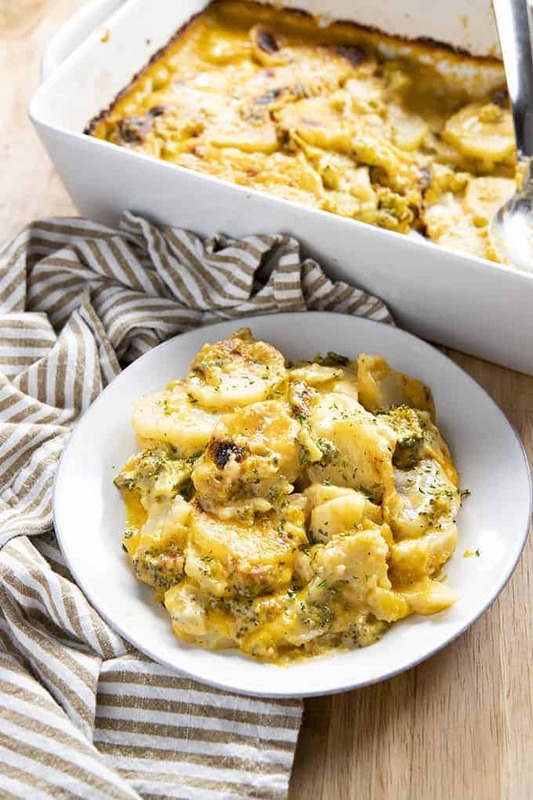 Mmm I love scalloped potatoes and your Broccoli Cheddar Scalloped Potatoes look so tempting!! Great photos too!